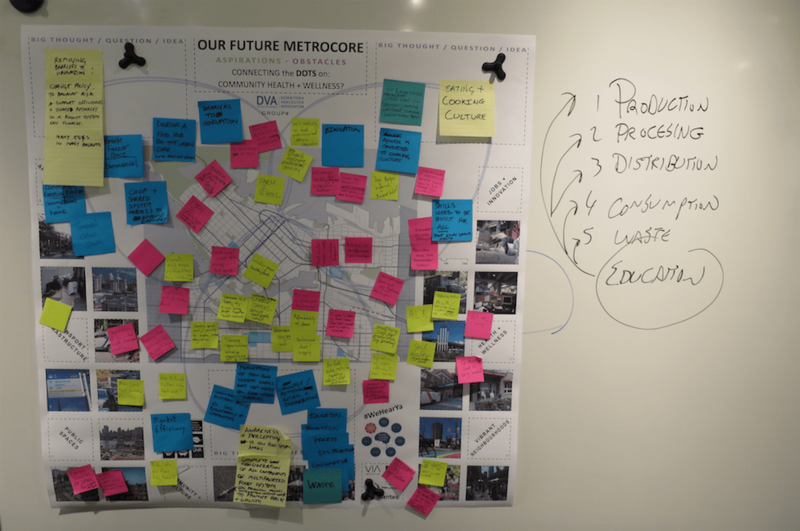 On December 3, 2015, the DVA held its fourth in a series of Metrocore Quilting roundtables exploring the connection between this year’s subject area Health and Wellbeing and some of the key components of successful city-making. The goal is to generate a “quilt” of insights leading to inform the development of a DVA advocacy strategy on the subject of Health and Wellbeing. The December 3 roundtable hosted by Bunt and Associates brought together participants involved in the realm of food distribution to explore the shared understanding between residents, businesses, and community organizations that can help us inform our position on health and wellbeing in Vancouver’s Metrocore. Removing barriers to innovation. Change policy to balance risk and support efficiencies + share resources so that a robust system can flourish. Many eggs in many baskets. Awareness + Perception to how food systems work. Complete consideration of all components of a multifaceted food system (education, production, process, distribution, consumption, waste) to promote health and wellness.